ANGKASA adalah jurnal ilmiah bidang teknologi yang diterbitkan oleh Pusat Penelitian dan Pengabdian Masyarakat (P3M) Sekolah Tinggi Teknologi Adisutjipto Yogyakarta yang dimulai dari Volume 1 Nomor 1 Tahun 2009 dengan nomor ISSN cetak 2085-9503 dan diterbitkan secara on line dengan ISSN 2581-1355 menggunakan Open Journal System(OJS). 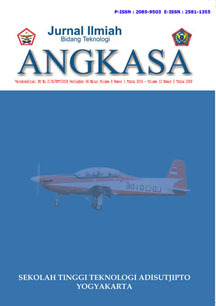 Angkasa hingga saat ini sudah terindek di database PKP, Science and Technology Index(SINTA), Garba Rujukan Digital (GARUDA), Bielefeld University Library (BASE), NELITI, Perpustakaan Nasional Republik Indonesia (One Search), dan Google Scholar dengan indek h-index 5. 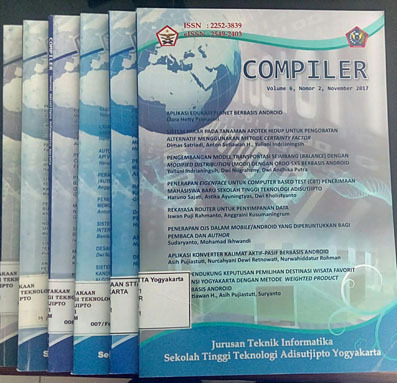 The compiler is a scientific journal published by the Informatics department at the STTA. The first printed publication in 2012 with ISSN 2252-3839, issues were published twice in one year, May and November. In 2016, the Compiler has an ISSN On Line 2549-2403 number which is used for publishing online using the Open Journal System (OJS). Compilers to date have been indexed in the Science and Technology Index (SINTA), Garba Rujukan Digital (GARUDA), Bielefeld University Library (BASE), NELITI, Microsoft Academic and Google Scholar with h-index = 3. in scholar metric. With the increase of Compiler status as an accredited journal in accordance with Decree number 21 / E / KPT / 2018 with rank S5 for issue of Volume 5 Number 1 in 2016 - Volume 9 Number 2 in 2020, the latest Journal Compiler template (starting with Volume 7 Number 2 2018) can be downloaded here (click).Submitting articles to be published in the Compiler through this web site by first registering, you can read the technical instructions on the right side menu of this web. 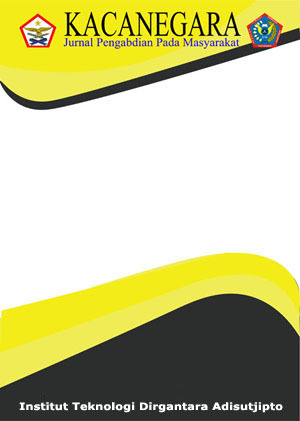 If the article sent is not the same as the template, then the editor will reject or return it before being reviewed further. Articles that have passed this stage will then be reviewed by the reviewer. Reviewers will provide an assessment and input for changes to the articles needed so that the article is published by the Compiler.